Publishers who have noticed their overall reach on Facebook has dramatically declined over the past few months can at least have peace of mind that they're not alone. According to an analysis by SocialFlow, publishers on Facebook have experienced a rapid decline in overall reach during the past few months. The social analytics company examined 3,000 Facebook pages, most of which are publishers who have a collective annual impression count of around 500 billion reaching 600 million unique users. 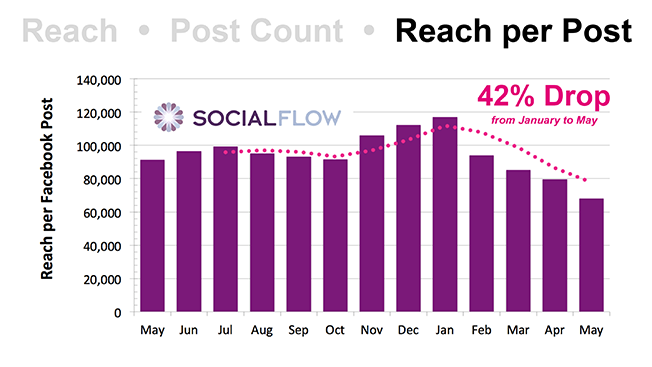 And what it found might be a bit depressing to all the hard working journalists of the world: In May, publishers produced around 550,000 posts that went through SocialFlow's platform—up from 470,000 in April—but overall reach from January to May was down 42 percent per post. That's a "pretty notable drop," said SocialFlow CEO Jim Anderson. "We said, wait a minute, if the reach is staying flat but the posts are going up, the only possible conclusion there is that my reach per post is going down," he said in an interview. 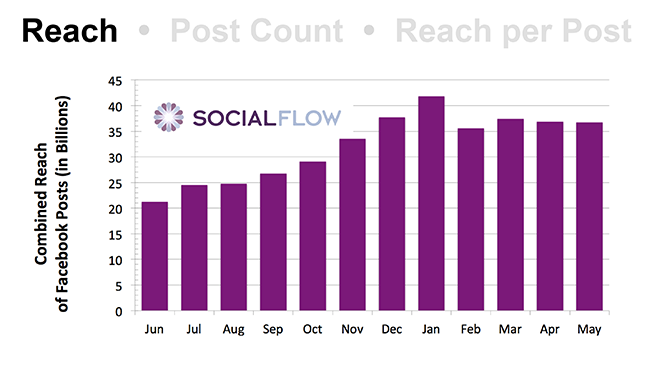 According to SocialFlow data, total media reach across all pages had been steadily increasing from June 2015 through January 2016. And while post counts have continued to go up—now more than double the 220,000 count in June 2015—reach per post peaked in January at nearly 120,000. "It's hard to look at that data and say that doesn't hurt publishers, right?" Anderson said. "It's a 42 percent drop in the reach per post. It's hard to objectively look and say, 'Wow, that's a good thing if I'm a publisher and I'm the one publishing the content, because I want reach, I want traffic, I want eyeballs.'" It's tough to tell what exactly caused the shift at the beginning of the year, but Anderson mentioned a few possibilities: Facebook's algorithm might be adjusting to give more prominence to personal posts—a way to prevent the reported decrease in engagement on the platform—or it could be that the algorithm is choosing to only show users a limited number of posts from any given publisher to prevent newsfeed overload. According to data last year from the Pew Research Center, about 47 percent of a survey of 2,000 adults using Facebook said they get their news from Facebook, while about 40 percent of all U.S. adults did the same. The study also found that Twitter users had a more diverse range of topics and were more likely to follow media organizations on the platform. While Anderson doesn't think Facebook is necessarily doing anything maliciously to hurt publishers in favor of others, he said there's no denying that the results aren't rosy. However, it said Facebook is faced with the challenge of balance the needs of competing entities in a way that's good for not just publishers but also brands and users. "I think these algorithms are a bit of a dark art to many people," he said. "We think it's important and we are excited to provide some visibility to what's going on. 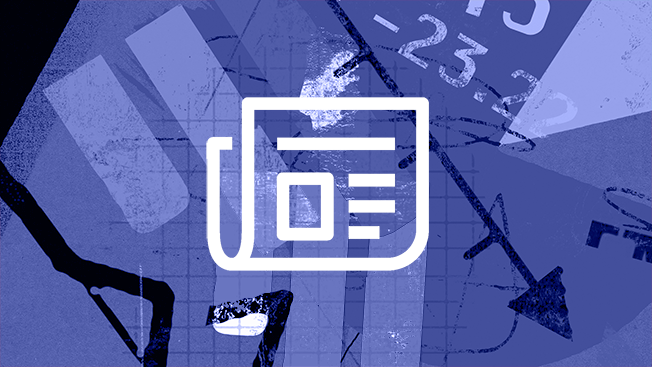 Because even when you can't control it, knowing what's happening and understanding how your volatility compares to the rest of the industry or similar publications lets you run your business more effectively." If anything he said the results are a sign that publishers should spend time examining their content to see what's going well and what's not. If their reach is higher than before, they're bucking the trend. If not, media companies struggling for more page views can rest assured that they're not alone. "It's sort of like if I got wet on the way to work because it was raining outside. There was water coming from the sky—that's why you got wet. And you can argue whether you should have had an umbrella, but it's that kind of thing. There's just no good way for media companies to know on a systematic basis what's going on with other media companies."